Philosophy Talk | The program that questions everything...except your intelligence. Authority can refer to people or institutions that have the political power to make decisions, give orders, and enforce rules. It can also refer to a certain kind of expertise or knowledge that we might defer to. Sometimes we respect authority, and sometimes we resist it or even revolt against it. But where exactly does authority come from, and when, if ever, ought we defer to it? How do we challenge authority? What makes an authority figure authoritarian? The week of April 7 we re-broadcast our 2016 program with John Pollack, author of The Pun Also Rises: How the Humble Pun Revolutionized Language, Changed History, and Made Wordplay More Than Some Antics. It's fair to say that puns (and humor in general) loom large in our work here at Philosophy Talk, whether delivered off the cuff or to make deeper points about language and (mis)understanding. The Philosophers have also stepped back a handful of times to question their assumptions about what makes something funny, so we've pulled those episodes from the archive for some National Humor Month listening that might just leave you in stitches. Click the smiles above to see the episodes we have in store for you! 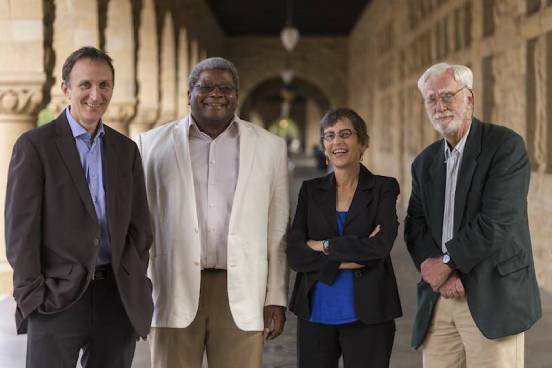 Philosophy Talk celebrates the value of the examined life. Each week, our philosophers invite you to join them in conversation on a wide variety of issues ranging from popular culture to our most deeply-held beliefs about science, morality, and the human condition. Philosophy Talk challenges listeners to identify and question their assumptions and to think about things in new ways. We are dedicated to reasoned conversation driven by human curiosity. Philosophy Talk is accessible, intellectually stimulating, and most of all, fun! We would love to hear from you - let us know your thoughts!